The mobile operating system developed by Google is unequivocal the champion of personalization. Indeed, unlike Apple who wants to keep control of the user experience, Google, he gives complete freedom to customize his system. And this is not to displease its users, quite the opposite. From live wallpaper to a radical change in the interface, everything is possible with applications that are going well. We can also thank the developers who each day we lay wonders to make our smartphones unique and enjoyable to use. 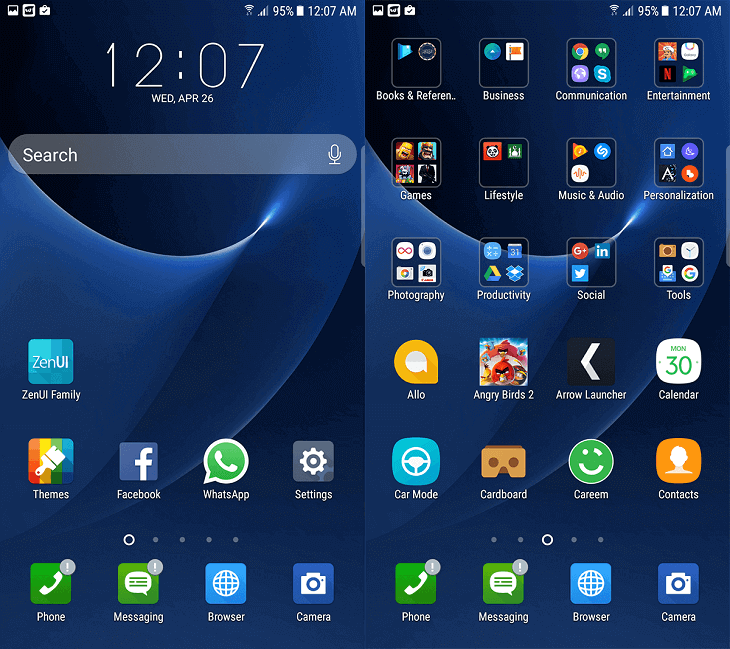 In this article, I present a selection of the best pitchers of applications (or launchers) to customize your Android smartphone or tablet. Of course, there are lots of others, but I have selected for you the ones that for me are the most interesting. 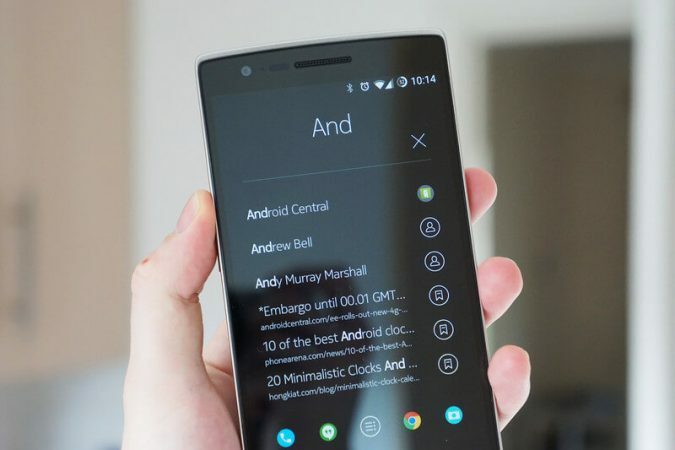 For more interesting articles you can Visit Androidehow. We start of course with a must in terms of an alternative application launcher, namely Nova Launcher. The latter offers an easy to use interface, packed with customization options and very fluid. Customizable icons, theme colors, desktop number, dock management and so on. Everything is there to customize your smartphone or tablet according to your tastes. Note that a paid version is offered at a price of € 5.25 and that unlocks other options such as creating custom motions, creating new tabs or folders in an application drawer or defining custom actions on application shortcuts. We continue with Hola Launcher, a very good application launcher for Android. The application offers many fully customizable themes and some interesting features like the ability to access the apps you use the most by simply swiping to the lower left or right corner of your Android device. All in an extreme-fluid interface. 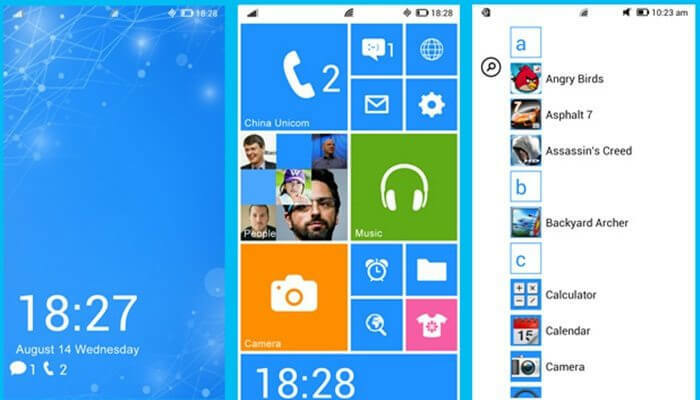 Arrow Launcher is the application launcher developed by Microsoft Garage not for Windows Phone users, but for Android users. 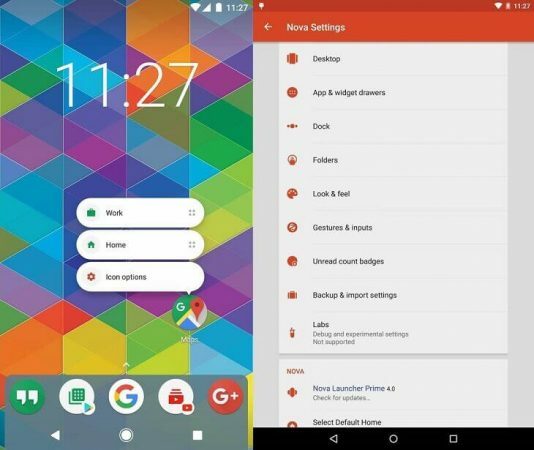 Light, fast and efficient, the Arrow Launcher app adapts to your habits. After several days of use, you will notice for example that your applications will be automatically organized according to your use, and your important contacts will be highlighted. In terms of features, Arrow Launcher integrates Wunderlist, the famous task management application that Microsoft credited in 2015. Thanks to it, you can program reminders and synchronize them so you can consult them on any medium like PC, Web or smartphone/Ipad. The Apex launcher has many similarities to Google Now Launcher (that of the Nexus and Pixel smartphones). 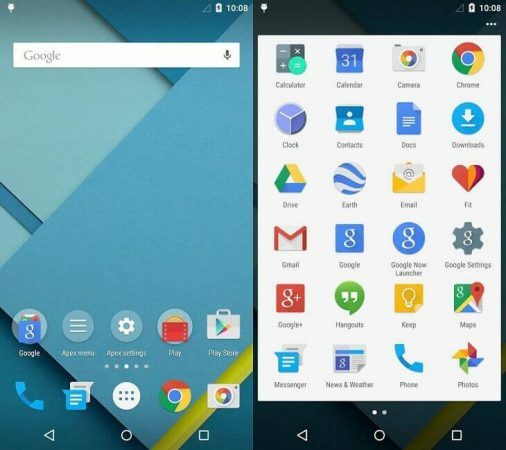 We find the famous Google search widget, the same application drawer, and almost identical icons. It is fast, stylish and deals many customization tools. For example, you can hide drawer applications, sort apps automatically based on usage, and when they were installed. You can also install custom icons and menus. In short, another launcher to test. 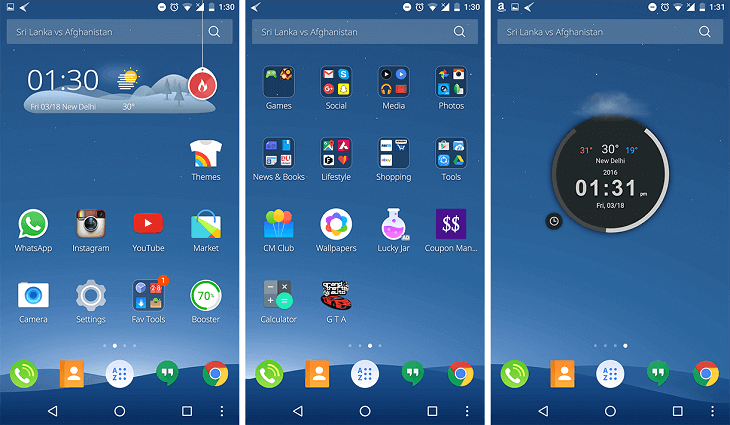 Smart Launcher offers a simple and low-cost interface to system resources. Once installed, you’ll see a sidebar cracking up. It simply allows you to access the categories of your applications installed on your Android device. You will also be able to customize the outdated application grid with a more creative circular approach and quick access. 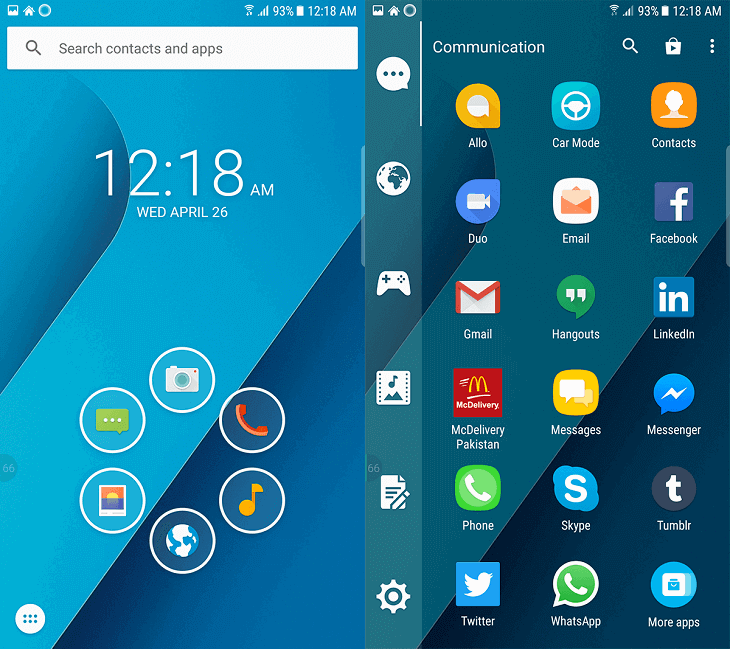 The ZenUI Launcher is a fully customizable application with themes, wallpapers, and widgets. 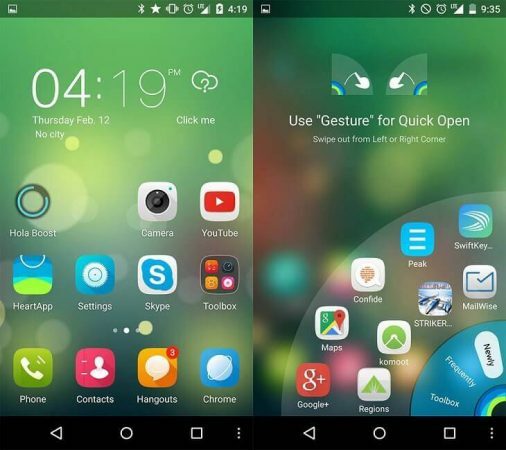 ZenUI allows you to modify application icons and apply animated effects for scrolling and changeovers. 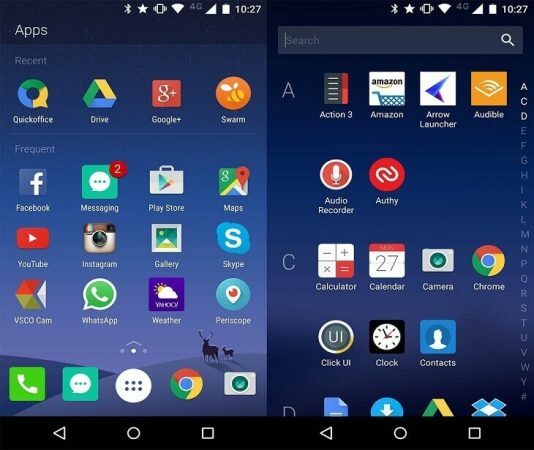 ZenUI Launcher also lets you hide applications from your drawers. The Nokia Z Launcher focuses primarily on the user’s habits throughout the day. Thus, the application will be able to offer you faster access to applications that you use that day at this time. In addition, the Nokia Z Launcher includes a particularly interesting feature, namely scribble. It allows to write on the screen and by hand a letter that will automatically launch an application. If you like the Windows Phone interface with the file system, I suggest you download Launcher 8. Once installed, your Android device will look like two drops of water to a Windows Phone. Of course, everything is fully customizable: tile, lock screen, status bar, folders, theme, wallpaper, notifications, etc. CM Launcher 3D is an application launcher developed by Cheetah Mobile, the company behind the excellent CM Security and the famous Clean Master. As its name proposes the world’s first launcher powered by a 3D engine. It offers various graphic effects that will overturn the codes of flat and traditional interfaces that we know. In addition to thousands of free themes, CM Launcher 3D incorporates the best anti-virus engine (AV-TEST) that will protect your phone from the theft of privacy and the threat of malware. 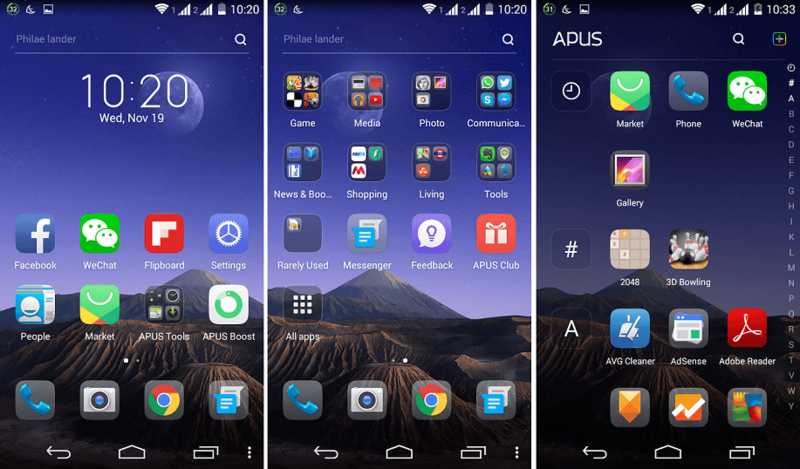 Finally, I finished with APUS Launcher, a launcher that offers a simple interface, fast and very advanced. Your applications will be automatically organized by category or use. All your messages (SMS, Facebook, Twitter, and WhatsApp’s) will be grouped on one page so that you can read and respond more quickly.